Wonder Boy: The Dragon's Trap physical release date for Europe unveiled! You’ve been expecting it and now it’s official: Wonder Boy: The Dragon’s Trap physical release by Headup Games for Nintendo Switch and PlayStation 4 will hit major retailers in Europe, Australia and New Zealand on April 19, 2018! Get your hands on the reversible retro cover and retro-style manual, reminiscent of the SEGA era of gaming and grab your own adorable phone strap featuring the main character. 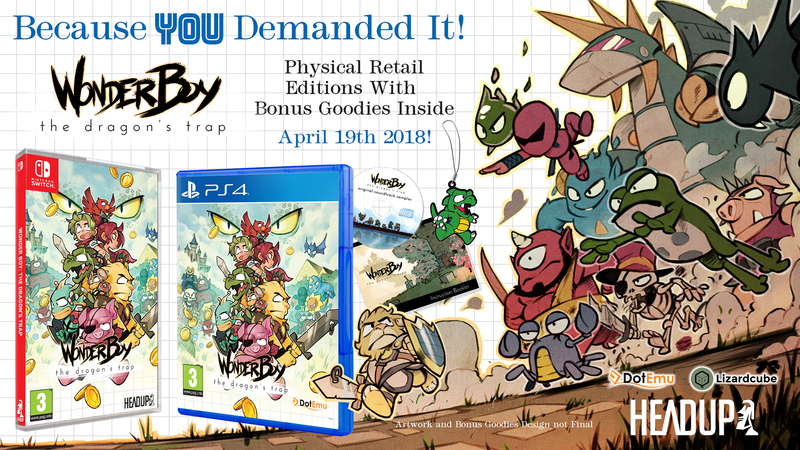 Headup Games’ retail editions of Wonder Boy: The Dragon’s Trap will be in stores on April 19 2018 for €39.99 / £34.99.